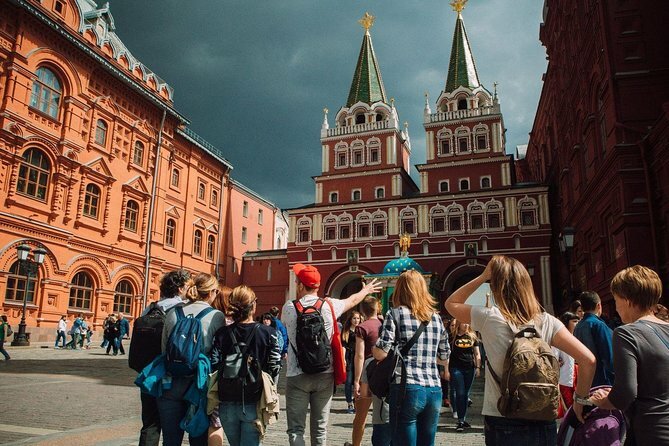 Moscow can be a tricky city to navigate by yourself but you don’t have to do it alone if you join us for this all-encompassing tour and see the city the right way! We’ll tick off all Moscow’s must-visit cultural gems such as St Basil’s Cathedral and Tverskaya Street before descending beneath the city to admire Moscow’s world-famous underground. We’ll end with a delicious taste of Moscow as we visit the locals' favourite market and sample some of the many delights of Russian cuisine. We’re talking caviar! Pickles! Jams! Uzbekistani pilaf! And lots more besides. This tour is your ticket to discovering the delights of Moscow in one day, without the stress and hassle of doing it yourself; we hope you can join us! - If you’d like to go inside the Russian Orthodox Church, please be sure to wear clothing that covers your legs to below the knees. Woman must also have a scarf to cover their head. - For your Urban Adventure you will be in a small group of a maximum of 12 people and 6 people during local market experience. This thrill-packed full-day tour combines three of our most popular Moscow tours: Behind the Icons, a shortened version of Moscow Underground and Eat like a Russian. The first part of your tour is dedicated to some of the city’s most important Soviet landmarks, including a monument to Pushkin, the avantgarde building of the former main soviet newspaper; and even the first McDonald’s in Russia. From there, we’re going 100% authentic with a taste of local Russian fast food. We’ll visit a spot that’s popular for selling chebureks, which are deep-fried pastries filled with minced meat. Wash it down with a traditional Russian soft drink or tea. We’ll walk along Tverskaya Street, passing more of Moscow’s main landmarks, such as the monument to the founder of the city and the governor’s house. Along the way, we’ll visit a Russian Orthodox Church, where we can light a candle and, if we’re lucky, listen to some beautiful choir songs. Then it’s on to Red Square, where you can spot all the legendary landmarks found in the guidebooks such as Lenin’s Tomb. You’ll also find the GUM department store, with its outstanding interiors and many soviet attributes. And finally, the main highlight of course, the 16th-century St. Basil’s Cathedral, with its bright and colourful domes. We’ll stop for a break at this point, so you can go and grab yourself a light lunch (remember to leave room for our food tastings this afternoon!) or a drink. Then we’ll head towards the Danilovsky by metro. On the way, we are going to make a detour around three Moscow metro stations to show off the artistic and architectural masterpieces that are hidden under Moscow’s city streets. Finally, we’ll arrive at the tastiest part of our tour — the food market. We’ll start with nature’s bounty: Russian honey served with herbs and berries. Next it’s on to appetisers and you’ll try the freshest cheeses and curd from the Caucasian region. You’ll then try juicy tangerines from Abkhazia if it's winter or delicious apples in summer from the gardens around the city. Then it’s on to two proper Russian delicacies. First is smoked lard, which sounds a bit odd to the western palate, but trust us, it’s rich, fulfilling and delicious! Then, red caviar from the island of Sakhalin, an absolute must-eat while in Moscow. Next we’ll time travel to the Soviet era to take a peep at a typical kitchenette where you can taste the secret cure to every Russian’s hangover, salty cucumbers and sauerkraut. After these salty delicacies, a Kvas or fruit-drink will banish your thirst. We’ll then head south to explore our favourite dishes from Uzbekistan and Dagestan, pilaf and chudu (bread) with cheese or pumpkin, finishing off with tea and pies. We recommend the sweet pie with poppy seeds. Yummy! Happy and full, you’ll be guided to the metro station where your tour will end. Before you go don’t forget to ask your local guide for tips.